"Your family will love this hearty Italian casserole made with Progresso™ Recipe Starters™ fire roasted tomato cooking sauce." Heat oven to 375 degrees F. Cook and drain pasta as directed on package. Meanwhile, in 12-inch skillet, cook sausage over medium-high heat, stirring occasionally, until no longer pink; drain. Add cooking sauce, 1/4 teaspoon pepper and the cooked pasta; stir well. In small bowl, mix ricotta cheese, Parmesan cheese and egg. Spoon pasta mixture into ungreased 11x7-inch (2-quart) glass baking dish. Spoon ricotta cheese mixture on top; sprinkle with mozzarella cheese. Spray sheet of foil with cooking spray; cover baking dish with foil, sprayed side down. Bake 25 to 30 minutes, removing foil last 10 minutes of bake time, until cheese melts and mixture is hot and bubbly. Sprinkle with basil. Make crispy garlic chicken the super quick-and-easy way! 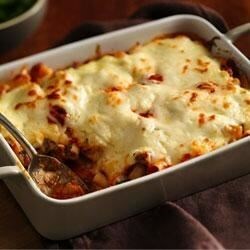 *Instead of ricotta cheese, you can substitute 3/4 cup cottage cheese and increase Parmesan cheese to 1/2 cup. For extra-easy cleanup, line the casserole with foil. For even more flavor, try using hot Italian pork sausage. Excellent dinner. Forgot to get rolls, my bad. But still excellent!